Millions of readers around the world have fallen in love with the small town of Big Stone Gap, nestled in the Blue Ridge Mountains of Virginia, and the story of its self-proclaimed spinster, Ave Maria Mulligan. In the series’ enchanting debut, Ave Maria reaches her thirty-fifth year and resigns herself to the single life, filling her days with hard work, fun friends, and good books. Then, one fateful day, Ave Maria’s past opens wide with the revelation of a long-buried secret that will alter the course of her life. Before she knows it, Ave Maria is fielding marriage proposals, trying to claim her rightful inheritance, and planning the trip of a lifetime to Italy—one that will change her view of the world and her own place in it forever. Full of wit and wonder, hilarity and heart, Big Stone Gap is a gem of a book, and one that you will share with friends and family for years to come. Adriana Trigiani is beloved by millions of readers around the world for her fifteen bestsellers, including the blockbuster epic The Shoemaker’s Wife; the Big Stone Gap series; Lucia, Lucia; the Valentine series; the Viola series for young adults; and the bestselling memoir Don’t Sing at the Table. Trigiani reaches new heights with All the Stars in the Heavens, an epic tale from the Golden Age of Hollywood. She is the award-winning filmmaker of the documentary Queens of the Big Time. 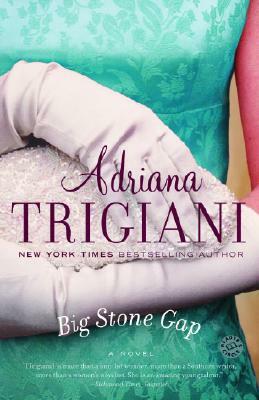 Trigiani wrote and directed the major motion picture Big Stone Gap, based on her debut novel and filmed entirely on location in her Virginia hometown. She lives in Greenwich Village with her family. "Charming . . . Readers would do well to fall into the nearest easy chair and savor the story." "Delightfully quirky . . . chock-full of engaging, oddball characters and unexpected plot twists, this Gap is meant to be crossed." "As comforting as a mug of chamomile tea on a rainy Sunday." "A touching tale of a sleepy Southern town and a young woman on the brink of self-discovery and acceptance." "Ave Maria's spunky attitude, sardonic wit, and extravagant generosity compel you into her fan club . . . . Delightfully entertaining." "A delightful tale of intimate community life [where] the characters are as real as the ones who live next door." "In a sassy Southern voice, [Trigiani] creates honest, endearingly original characters."